It is quite natural for people to express some degree of skepticism, or even negativism, about something they have not previously experienced in their lives. For example, some might say that they do not like seafood but have never actually tasted/eaten it, in much the same way that people who have never traveled by airplane might be critical about seating being cramped and uncomfortable. Why is this mindset a common occurrence? Aside from the fact that some people simply seem to like finding fault with anything and everything, many people have their routines and preferences and therefore can become a bit uncomfortable when asked to do or try something different; instead of viewing a new situation as a chance to grow, improve, or gain some experience, their defence mechanism leads them to find reasons or rationalize why they should not move forward. On the medical side of the ledger, this attitude may be present when hearing specialists and their patients discuss the use of hearing aids for the first time. In these instances, there can be a tendency, on the patient’s part, to dismiss or balk at the recommendation due to pre-conceived prejudices or misconceptions – and perhaps a measure of personal pride as well. 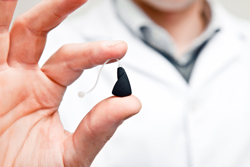 In fact, all of these misconceptions can be dispelled through consultation with a certified professional such as the hearing aids specialists at Bravo Hearing Centre in Etobicoke. It will be important for patients to engage/participate in these conversations with an open mind, however, in order to appreciate the many hearing aid styles and options available and make an informed decision on the device that best meets their hearing and lifestyle needs. Although hearing aids do not restore the normal functioning of one’s ears, they can certainly help restore quality of life by resolving matters of sound quality and improving the clarity and understanding of conversations, audio portions of television/radio broadcasts, public announcements, presentations, etc. For more information on the range of hearing products and services provided by Bravo Hearing Centre in Etobicoke, please see our Hearing Services page and our Products page. If you have any questions or apprehension about the benefits or use of hearing aids, call the hearing specialists at Bravo Hearing Centre in Etobicoke today at 416-207-9711 to request a complimentary consultation at your convenience.